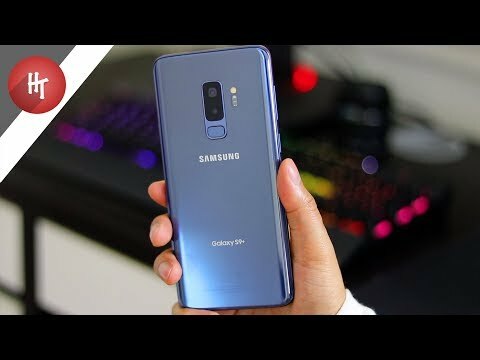 Samsung Galaxy S9 Plus Review - 1 Month Later - The BEST Smartphone! Hey, what's going on people it's Shon from HiTech. the Samsung Galaxy S9 Plus is the best phone out right now. Now I'm not saying it's the best at everything. they make their phones with very high quality and the S9 Plus is no exception. It has an aluminum build with Gorilla Glass 5 on the front and back. made the top and bottom bezels on the front slightly thinner. Second, on the back the camera orientation is now vertical. below the camera so that it's more towards the center of the phone. The setup for the finger print reader is probably one of the fastest I've seen. You literally just have to swipe down on it one time and you're done. It's also really fast and responsive. On the top of the phone is the SIM card and microSD card slot. With the micoSD card slot you can expand the internal storage of the phone up to 400GB. A USB-C port with fast charging and yes, the fast charger comes with the phone. And unlike most phones these days, Samsung is still including the headphone jack. The display is stunning and appears to be Samsung's best OLED display yet. It's a 6.2" display with a max resolution of 2960x1440. X's display which was custom designed by Apple and manufactured by Samsung. tastes but thankfully you can change the color saturation in the display settings. There's been a lot of hype around the cameras in the S9 Plus. 1.5 to 2.4 depending on your lighting conditions. This is the first phone to have a variable aperture lens. And it does make a difference in low light situations. of 2.4 let's in plenty of light and that's what the camera defaults to. someone who takes a lot of low light photos. Do I think it's the best camera, no. I still like the Pixel 2 XLs camera the most. And I still prefer the color processing of the iPhone X. But I'm certainly not disappointed with the photos coming out of the S9 Plus. At this point, all the top phones take amazing pictures. at 960 frames per second at a 720p resolution. with a 3500 mAh battery. It's also supports wireless charging and is IP68 water and dust resistant. And as far as performance goes I have zero complaints so far. Everything is smooth and fast. I haven't had any hiccups or lag at all. To me it's actually just as smooth as stock android on my Pixel 2 XL. Whether or not it stays this way remains to be seen. I may make an update video to let you know how things are in a couple months. Samsung's Touchwiz skin is still there and you're either going to love it or hate it. I personally don't mind it that much though I'd still prefer stock android. So yea like I said this phone makes very few compromises. There's very few things that a smartphone could have that the S9 Plus doesn't. I wouldn't go so far as to say that it's the absolute best at everything. Alright guys that's going to wrap up this review. Let me know down in the comments what you think about the Galaxy S9 Plus. If you liked this video go ahead and give it a like. And subscribe and hit the bell so you don't miss any of my new videos. Thanks so much for watching and I'll see you guys later.